Charlottesville, Virginia: The market for embedded optics is expected to reach US$5.5 Billion in 2022, according to “The Embedded Optics Market: COBO and its Alternatives – 2017-2026,” a new report from Communications Industry Researchers, Inc. an optical networking industry analyst firm. The report notes that the standardization efforts of the Consortium for on-Board Optics (COBO) group could make embedded optics technology much more popular in the optical networking industry and lead to a new “post-pluggable” transceiver era. Details about the report including a table of contents and downloadable excerpt are available at https://cir-inc.com/reportss/the-embedded-optics-market-cobo-and-its-alternatives-2017-2026. 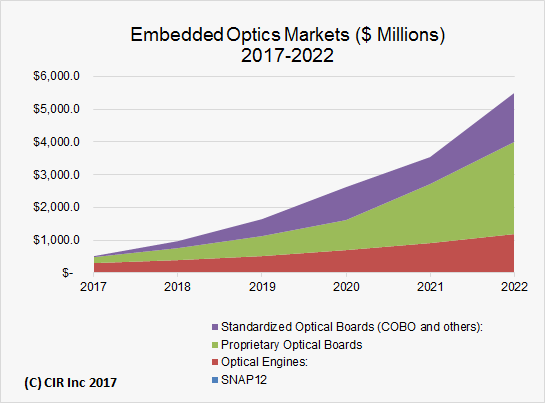 This report provides a complete analysis of the commercial opportunities for embedded optics and includes a technology assessment and ten-year market forecast of: SNAP12 modules, optical engines, proprietary optical boards (including optical backplanes) and COBO-compliant boards. This study also examines the market potential for co-packaging in the race to produce the most cost-effective embedded optics. And this report discusses whether OSFP and QSFP-DD can help “save” pluggables and push off the need for embedded optics for another generation of optics. The report examines how switch, router and server firms can profitably message the advantages of embedded optics to data center managers, telecom companies and other end users. Also included is a roadmap for embedded optics gradually transitions from the largest routers all the way down to the server level. In addition, the report contains a detailed ten-year forecast of the primary products and markets that will be impacted by embedded optics. The forecast is both in terms of unit shipments and revenues, with breakouts by the type of embedded optics technology, data rates and media used. The report also includes a discussion of how important firms likely to adapt their product/market strategies to the embedded optics future. 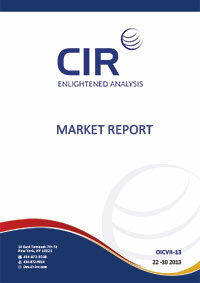 In particular, the report includes profiles of companies that we believe will shape the embedded optics market. The companies profiled include Amphenol/FCI, Elenion, Finisar, Furukawa Electric, Gigalight, Luxtera, Mellanox, Molex, Ranovus, Reflex Photonics, Samtec, ST Microelectronics and TE Connectivity. COBO has recently formally defined its connector standards and is currently working on embedding coherent optics into its standards. By 2022 CIR expects COBO-compliant products to generate revenues of US$1.5 Billion. However, not all players believe that there is a need for COBO, claiming that optical networking that QSFP-DD and OSFP pluggables can support optical networking up to the Terabit networking era. The current generation of 200 Gbps to 300 Gbps optical engines have never been huge revenue generators, causing some firms (notably TE Connectivity) to drop out the market. However, the report anticipates that a new generation of optical engines will emerge that will be more appropriate to the needs of today’s optical networks. For example, Furukawa Electric has demonstrated a 1.3 Tbps optical engine. Elenion Technologies’ optical engine incorporates modulation flexibility. Gigalight, has also released an optical engine with advanced optical monitoring capability. Based on the new functionalities of optical engines, the optical engine will grow to reach US$2.8 Billion in revenues by 2022. The report also suggests that the rise of embedded optics will stimulate the need for novel component technologies. In particular, it notes that VCSEL technology will run out of steam at above 50 Gbps or below—data rates that embedded optics is expected to operate at. Embedded optics firms will increasingly need to think about alternatives. Ranovus, with its quantum dot lasers, looks especially interesting in this regard. There may also be some opportunities for additional cooling components and heat sinks for embedded optics – as data rates go up pre-heating of the air by high power ICs can present thermal challenges for optics.